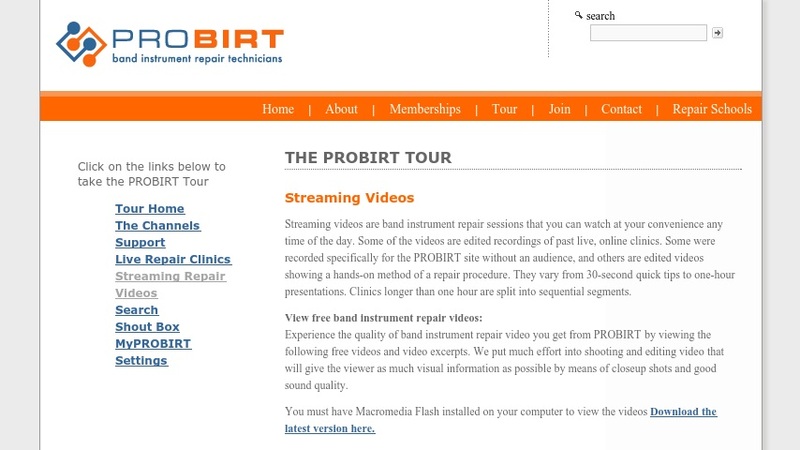 This section of the Professional Band Instrument Repair Technician (PROBIRT) website offers several video segments on band instrument repair. Some of the videos are edited recordings of past live online clinics, and all videos require a recent version of Macromedia Flash. The video segments are well done and professional, allowing viewers to observe hands-on demonstrations of instrument repair techniques including plenty of close-up shots and good sound quality. While some video clips are subsections of longer videos which require PROBIRT membership for full viewing, most of the video clips are useful and long enough to be of value.